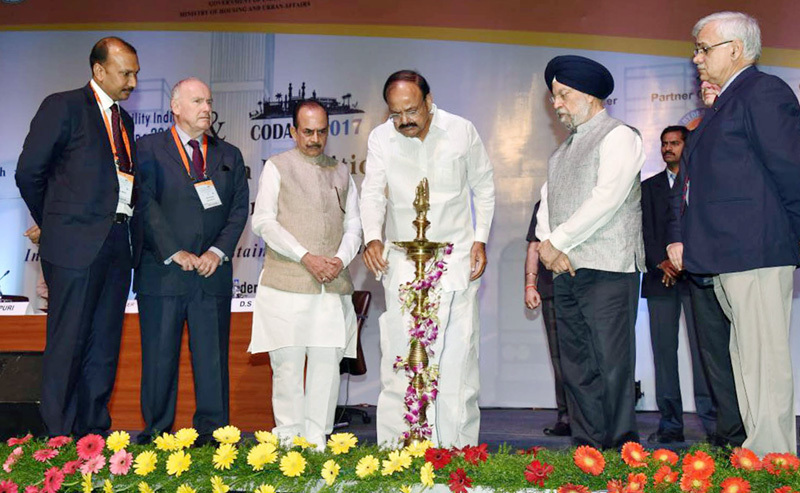 The Vice President, Shri M. Venkaiah Naidu lighting the lamp at the Inaugural Session of 10th Urban Mobility India Conference & Exhibition, 2017 and CODATU XVII Conference, in Hyderabad on November 04, 2017. The Minister of State for Housing and Urban Affairs (I/C), Shri Hardeep Singh Puri, the Deputy Chief Minister of Telangana, Shri Mohammad Mahmood Ali, the President CODATU, France, Mr. Dominique BUSSEREAU and other dignitaries are also seen. Hyderabad: The Vice President of India, Shri M. Venkaiah Naidu has said that there has to be an increased focus on planning and design for sustainable and clean urban mobility. He was addressing the Inaugural Session of 10th Urban Mobility India Conference & Exhibition, 2017 and CODATU XVII Conference, in Hyderabad today. The Minister of State for Housing and Urban Affairs (I/C), Shri Hardeep Singh Puri, the Deputy Chief Minister of Telangana, Shri Shri Mohammad Mahmood Ali, the President CODATU, France, Mr. Dominique BUSSEREAU, the Ambassador of France to India, Mr. Alexandre Ziegler and other dignitaries were present on the occasion. The Vice President said that urbanisation is one of the realities of the 21st Century, which is called as urban century. He further said that the 2011 Census has clearly shown that urbanization in India is gaining momentum where every third person is living in urban areas. The current urbanization patterns are causing unprecedented challenges to urban mobility systems, he added. The Vice President said that urban transport accounts for about 25% of the greenhouse gases worldwide. He further said that it is also the major cause of local air and noise pollution in cities which cause ill health. The traffic congestion created by the transportation systems is responsible for significant economic and productivity costs for commuters and transporters, he added. The Vice President said that promoting Non-Motorized Transport infrastructure for walking and bicycle not only acts as last mile connectivity for well-established public transport systems but also has a positive impact on health. He further said that in the pursuit of sustainable mobility, promoting walking and cycling is very important. Need for more pedestrian paths and bicycle tracks to promote healthy lifestyle, combat diabetes & obesity and reduction pollution, he added. The Vice President congratulated the Government of Telangana for the implementation of the Hyderabad Metro Rail Project which, on completion, will become the World’s largest Metro Rail Project to be implemented in Public Private Partnership mode. He conveyed his best wishes to all in their efforts to create better mobility systems for better quality of life in urban centres. “I am delighted to be with you today at the inaugural session of the 10th Urban Mobility India Conference and Exhibition. It is heartening to know that this event is being organized by the Ministry of Housing and Urban Affairs, Government of India in partnership with the Government of Telangana. CODATU, an organization based in Paris, France, and involved in urban mobility, is also holding its 17th conference in conjunction with this conference. This is a flagship annual event of the Ministry of Housing & Urban Affairs, Government of India and has played a significant role in churning of ideas and exchange of knowledge in the field of urban mobility over the years. Urbanisation is one of the realities of the 21st Century, which is called as urban century. The 2011 Census has clearly shown that urbanization in India is gaining momentum where every third person is living in urban areas. Urban sector’s share of country’s GDP is expected to increase from its current 66 percent to 75 percent by 2031. The current urbanization patterns are causing unprecedented challenges to urban mobility systems. Despite the increasing level of urban mobility infrastructure worldwide, access to places/activities and services has become increasingly difficult in the urban areas. For decades, most of the countries have experienced rapid urban growth coupled with increase in use of motor vehicles. Unplanned urbanization has, in many cases, led to urban sprawl and thus generating even higher demand for motorized travel. This has resulted in a range of economic, social and environmental challenges. Urban transport accounts for about 25% of the greenhouse gases worldwide. It is also the major cause of local air and noise pollution in cities which cause ill health. The traffic congestion created by the transportation systems is responsible for significant economic and productivity costs for commuters and transporters. These challenges are more pronounced in cities of developing countries. These get further compounded by the fact that in the coming decades 90 % of the global population growth will take place in the cities of these countries. These cities are already struggling to meet the increasing demand for investment in transport systems. In many cities of the world, the mistake of drawing a similarity between mobility and transportation has fostered a tendency towards increasing motorization and a propensity to extend the network of urban roads. Needless to say, there has to be an increased focus on planning and design for sustainable and clean urban mobility. Mobility is not only a matter of developing transport infrastructure and services. It is also about overcoming the social, economic, political and physical constraints of movements. Recognizing mobility as an entitlement implies a focus on people, and removing the obstacles preventing people from reaching destinations. Public Transport: While private motorisation cannot be wished away completely, providing an affordable, comfortable, reliable and safe public transport can reduce the demand of private motorised vehicles. Global statistics demonstrate that the trips to work made in the world are around 30% on public transport. In India, the average share of public transport in 2011 was 30%. This will probably reduce to 22% by 2021. The lack of affordable and accessible public transport systems has led to the proliferation of informal operators, such as private minibus and microbus services. In some cities, informal carriers are the only forms of public transport available. High capacity public transport systems are needed to reduce the negative externalities like air and noise pollution, accidents and greenhouse gas emissions. They also provide inclusive access to low income groups. Last Mile Connectivity: For high capacity public transport to become popular, it is important to provide the last mile connectivity. If the commuter does not get comfortable mode for reaching the metro station or the bus stop, he is likely to use his personal vehicle. Non-Motorised Transport: Promoting Non- Motorized Transport infrastructure for walking and bicycle not only acts as last mile connectivity for well-established public transport systems but also has a positive impact on health. In the pursuit of sustainable mobility, promoting walking and cycling is very important. Development of pedestrian pathways and dedicated cycle tracks will go a long way in not only promoting sustainable urban transport but also improving the overall ecosystem of the public transport in the city. Need for more pedestrian paths and bicycle tracks to promote healthy lifestyle, combat diabetes & obesity and reduction pollution. Intermodal Integration: Integration between various modes of transport provides seamless connectivity for the commuters. This may include joint (transfer) stations, coordinated scheduling, joint fares, single ticket or common mobility card and combined public information activities. Basically integration can occur at three levels namely physical, operational and fare integration. Physical integration allows for close proximity of stations facilitating direct connection from one mode to another usually including transfer facility at stations. Cities in Western Europe have taken the lead in facilitating inter modal integration especially between public and non-motorised transport. Kochi metro has introduced a common mobility card which can be used in the metro, bus as well as in the water transport system. Other metro systems like Bangalore metro, Nagpur Metro &Lucknow metro are also adopting similar common mobility card. Integration of Land Use and Transport Planning: Development of a sustainable transportation system starts with the organization of the urban space with the main objective of reducing the need for travel and the length of travel distance. Neglecting the connection between land use and mobility has created the urban sprawl as can be seen in many cities. An integrated planning approach will yield positive results. One strategy for achieving this can be through Transit Oriented Development (TOD). Transit Oriented Development (TOD): Transit Oriented Development is a concept which emphasizes mixed and dense development around the high capacity public transport stations. By concentrating a mix of pedestrian oriented development around the metro or BRT stations, residents are more likely to catch a metro or a bus for out-of-neigbourhood trips and walk or bicycle for within the neighbourhood trips. Integrating public transport systems and the built environment makes both the public transport system and the city successful. I am glad to note that Ministry of Housing and Urban Affairs have formulated a National Transit Oriented Development Policy which can be used to formulate city specific TOD policy. With the increasing metro rail and BRT systems, cities should be encouraged to adopt the TOD policy. Innovative Financing and Land Value Capture: Investment requirements in high capacity Public Transport Systems can be huge due to the large gap in demand and capacity. Therefore it is important to explore the possibility of innovative means of financing. Issuance of bonds and financing of one corridor through land value capture by Bangalore metro is an example how agencies are trying to leverage on the innovative means of financing. The Land Value Capture Policy recently issued by the Government of India can be adopted by various agencies with help and facilitation by the respective city and state governments. Public Private Partnership: In recent times, more and more cities have chosen the Public Private Partnership (PPP) model for development and implementation of urban transport projects, to leverage both public and private resources and expertise. Some of the cities which have tried the PPP model in some form or the other in either provisioning of the metro rail or other high capacity public transport systems are Bangkok, Kuala Lumpur, Manila, Buenos Aires, Rio de Janeiro, Singapore, Hong Kong, and London. I would like to congratulate the Government of Telangana for the speedy implementation of the Hyderabad Metro Rail Project which, on completion, will become the World’s largest Metro Rail Project to be implemented in Public Private Partnership mode. A holistic and integrated approach to urban land use and transport planning and investment is needed if urban areas are to become socially, environmentally and economically sustainable. Many of the environmental challenges in the urban transport sector are rooted in its reliance on the non-renewable fossil fuel to propel private motor vehicles. There is a need to initiating a shift to clean fuels, retiring old polluting vehicles, strengthening mass transportation, and promoting use of electric vehicles, ensuring parking spaces before registering a car at-least in large metro cities. Better urban planning and a modal shift to public transport along with long-term transport plans are necessary to facilitate the growth of cities in a manner that does not damage the environment. Technical, fiscal and policy actions are needed to direct transport growth towards the path of sustainability. Urban mobility is finely woven into the spatial, social, economic, political and environmental fabric of cities. I would reiterate that urban transport is one of the key elements of urban infrastructure that calls for urgent action. The future of transportation in lies in sustainable smart mobility and eco-friendly alternatives. The planners, city authorities and civil society have all to join the mission to make our cities a better place to live in. Urban Mobility India Conference provides such a forum for stakeholder participation in understanding various contemporary issues of urban transport, benefit from the experiences of international and domestic experts, get knowledge about the best practices globally and interact with the peer groups from different organizations. I convey my best wishes to all of you in your efforts to create better mobility systems for better quality of life in urban centres.